He is in Group 3 of Class 1-C. He is a Guard in the magic class match and has a WI Plate. He cannot express his thoughts or speeches fully and so is unheard by most people in the class. 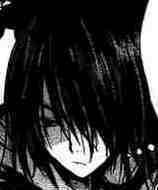 Although he doesn't know Kuzumi's true motives for not using his magic, he has a high amount of respect for him. He thinks that Kuzumi is a great man for restraining himself and letting the class recognize their own merit by actually working hard and putting in effort to win the magical matches. His main magic is called "Shadow Bind" which is used to Restrict the target's movements when the user's shadow contacts the target's shadow.